I found this idea on Pinterest and thought it looked like a fun, yummy idea and wanted to give it a try. A lot of people made these in the refrigerator, but I heard a lot of complaints about them being sticky when they were ready to eat. Then I found someone who made them completely in the freezer and they didn't come out sticky. I thought I'd shoot for the freezer, because I know I don't want sticky fingers and figured that no one else did either. The freezer is the way to go, no stickiness! I made 2 batches of them, one with Rum (super yummy) and one with Vodka (still pretty yummy). All you do is put the gummy bears in a container, I used one of those fake Tupperware containers you can buy at the store. Then you pour your alcohol of choice in, now let me tell you when I was reading all of these posts by others they all said to "cover" your gummy bears with alcohol....so I did, I made sure they were all covered. My end result, after leaving them in the freezer for a week was drunken gummy bears.....still soaking in a bit of alcohol. Not good! These guys tasted like a straight shot of alcohol, yuck! I ended up putting them in a strainer to get all of the excess alcohol out. I then put half of them in a paper towel lined bowl, then I put another paper towel over that half and poured the remaining half on top of that. As the hours went on, the bears became more and more enjoyable, until finally we were popping them like.....well, Gummy Bears! The end result was a very yummy treat, but the taste tests we did along the way gave us all squinched up puckered faces. Here's my adjusted recipe for Drunken Gummy Bears that I think will help them taste better. Put the gummy bears in the plastic container and level them out. Pour your alcohol of choice into the container giving yourself at least an inch of gummy bears above the alcohol. Put the lid on top and stick the whole thing in the freezer for a week. During that week, every 2 days I would give the container a good shaking to mix the gummy bears and whatever alcohol is left inside a good mixing. At the end of the week, take the container out of the freezer and stick it into the refrigerator if you want them cold, or on top of your counter if you want them room temperature (I would stick them on the counter), so that they can thaw out for a good 6 hours. 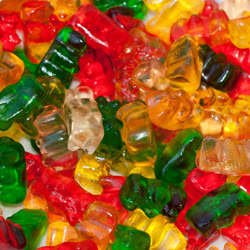 I personally liked the Rum flavored bears better, but the vodka ones weren't half bad. I guess it just depends on which alcohol you like best. 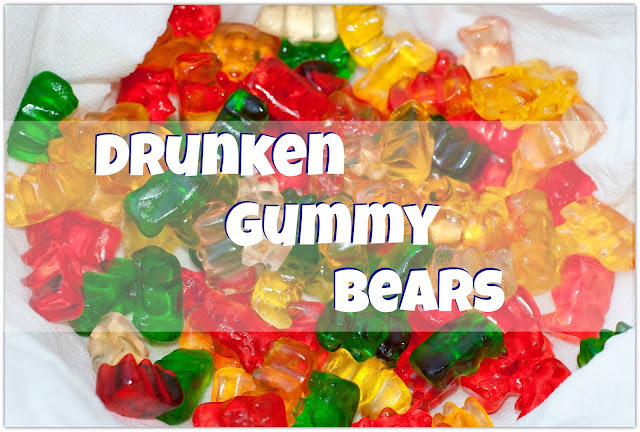 Drunken Gummy Bears used to be one of my favorite things to make for parties. They're so tasty! And now I am going to try out this recipe. 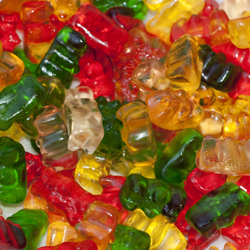 I love to eat gummy bears but never have I thought to prepare them with alcohol. Absolutely! You can do it with whatever kind of alcohol you'd like! I think wine would be fun! I love creating new boozy treats! I love that these are actually THAT simple! Thanks for sharing!!! OMG this looks amazing!!! I happen to like gummy bears, and well alcohol as well. Will definitely need to make these, just have to keep them away from the kids. Hahaha LOVE the honesty! I will have to try these and make sure I strain for a few hours before I eat them!